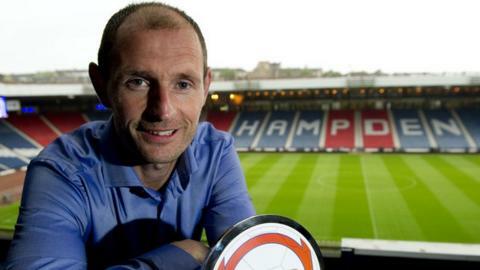 Queen of the South player-manager Allan Johnston has been named manager of the month for August in Division Two. Johnston, whose side face Rangers in the Ramsdens Cup at Ibrox on Tuesday, led his team to two wins and a draw in their league fixtures that month. And the Doonhamers remain on top of the division, as well as having knocked Hibernian out of the League Cup at the end of August. "It's a real team effort. It's not an individual's award," said Johnston. "It's an achievement that I pick up, but that's really just me picking it up on behalf of the boys. "The boys have been fantastic the way they've went about it since the start of pre-season," he told BBC Scotland. The Dumfries side began the month with a 5-2 victory over Alloa in the League Cup, before defeating Forfar 2-0 in their opening league match. An extra-time win away at Morton in the Ramsdens Cup second round was followed by a 0-0 draw with East Fife at New Bayview. A home 1-0 win over Albion Rovers preceded the 2-0 victory over Scottish Premier League Hibs on 28 August.